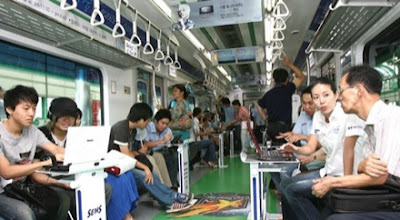 Ok, it's only a temporary gig but check out the "Sens e-train" offered to Seoul's subway jockeys over the next few days. The kids at Samsung and Korea Telecoms have fitted two cars from Seoul's number 2 line train with a dozen WiBro-enabled Samsung Q45 laptops and Q1 Ultra UMPCs. The hippest trip in S.Korea is operational (and free) from 1100 to 1700 daily until August 19th. We're just wondering what's more impressive: high-speed data while blasting along the underground rails or the lack of any visible organic excretions in a subway car.